Around 5 to 10% of people in the United States will have a peptic ulcer at some point in their lives. Between 10 and 20% of those infected with H. pylori will have a peptic ulcer during their lifetime. Ulcers develop when digestive juices produced in the stomach, intestines, and digestive glands damage the lining of the stomach or duodenum. In 1982, two Australian scientists identified the bacteria H. pylori as the main cause of peptic ulcers. Some NSAIDs pose greater risks than others for ulcers and bleeding. Research finds that taking a COX-2-selective NSAID (celecoxib) poses less gastrointestinal risk than a non-selective NSAID (such as diclofenac) plus a proton pump inhibitor (PPI). However coxibs carry a higher risk for heart attack and stroke than the others. Patients with peptic ulcer caused by H. pylori infection are treated most often with a triple therapy regimen including two antibiotics and a proton pump inhibitor (PPI). Other combinations are under study due to growing resistance to certain antibiotics. Endoscopy is recommended for patients over age 50 who have new symptoms of peptic ulcers, as well as for patients under age 50 who have alarm symptoms (such as unintended weight loss, gastrointestinal bleeding, or swallowing problems). Patients under age 50 who do not have alarm symptoms can be tested for H. pylori infection and treated if they are positive. Endoscopy may also be performed if peptic ulcer symptoms don't improve with treatment. Around 5 to 10% of people in the United States not infected with H. pylori will have a peptic ulcer at some point in their lives. Between 10 and 20% of those infected with H. pylori will have a peptic ulcer during their lifetime. 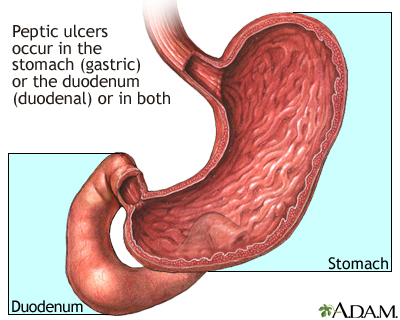 In the U.S., duodenal ulcers are 3 times more common than gastric ulcers. The mucus layer , which coats the stomach and duodenum, forms the first line of defense. Bicarbonate , which the mucus layer secretes, neutralizes digestive acids. H. pylori's corkscrew shape enables them to penetrate the mucus layer of the stomach or duodenum so that they can attach themselves to the lining. The surfaces of the cells lining the stomach contain a protein, called decay-accelerating factor, which acts as a receptor for the bacteria. H. pylori survive in the highly acidic environment by producing urease, an enzyme that generates ammonia to neutralize the acid. H. pylori stimulate the increased release of gastrin. Higher gastrin levels promote increased acid secretion. The increased acid damages the intestinal lining, leading to ulcers in certain individuals. H. pylori also alter certain immune factors that allow these bacteria to evade detection by the immune system and cause persistent inflammation -- even without invading the mucus membrane. Even if ulcers do not develop, H. pylori bacteria are considered to be a major cause of active chronic inflammation in the stomach ( gastritis ) and the upper part of the small intestine ( duodenitis ). H. pylori are also strongly linked to stomach cancer and possibly other non-intestinal problems. Genetic Factors. Some people harbor strains of H. pylori with genes that make the bacteria more dangerous, and increase the risk for ulcers. Immune Abnormalities. Certain people have an abnormal intestinal immune response, which allow the bacteria to injure the lining of the intestines. Lifestyle Factors. Although lifestyle factors such as chronic stress, drinking coffee, and smoking were long believed to be primary causes of ulcers, it is now thought that they only increase susceptibility to ulcers in some H. pylori carriers. When H. pylori were first identified as the major cause of peptic ulcers, these bacteria were found in 90% of people with duodenal ulcers and in about 80% of people with gastric ulcers. However, as more people are being tested and treated for the bacteria, the rate of H. pylori - associated ulcers has declined. Currently, H. pylori are found in about 50% of people with peptic ulcer disease. Patients with NSAID-caused ulcers should stop taking these drugs. However, patients who require these medications on a long-term basis can reduce their risk of ulcers by taking drugs in the proton pump inhibitor (PPI) group, such as omeprazole (Prilosec). Famotidine (Pepcid -- an H2 blocker) may provide less effective protection; studies are ongoing. Misoprostol has been approved for the prevention of NSAID-related ulcer disease. Bevacizumab, a drug used to treat colorectal cancer, may increase the risk of GI perforation. Although for many patients the benefits of bevacizumab outweigh the risks, GI perforation is very serious. If it occurs, patients must stop taking the drug. 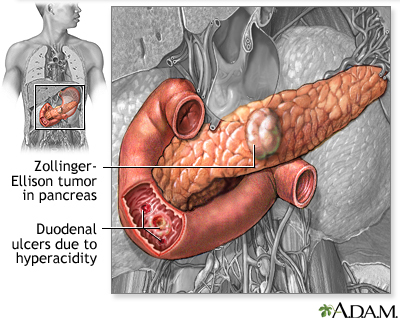 A large amount of acid is produced in response to the overproduction of the hormone gastrin, which in turn is caused by tumors on the pancreas or duodenum. These tumors are usually cancerous and must be removed. Acid production should also be suppressed to prevent ulcers from returning. An estimated 1 out of every 1 million people per year gets ZES. 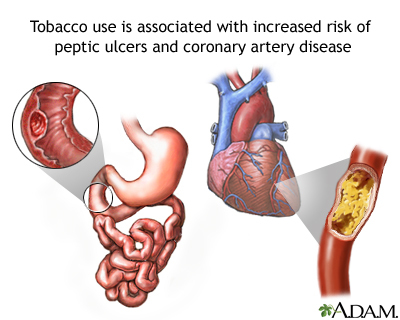 The incidence is 0.1 to 1% among patients with peptic ulcers. Typically the disease starts in people, ages 45 to 50, and men are affected more often than women. Peptic ulcers associated with ZES are typically persistent and difficult to treat. Treatment consists of removing the tumors and suppressing acid with an intravenous PPI (Protonix). In the past, removing the stomach was the only treatment option. The most common peptic ulcer symptoms are abdominal pain, heartburn, and regurgitation (the sensation of acid backing up into the throat). Many patients with the above symptoms do not have peptic ulcer disease or any other diagnosed condition. In that case, they have what is called functional dyspepsia . Recurrent abdominal pain and other gastrointestinal symptoms are common in children, and it is becoming the norm for pediatricians to screen for H. pylori infection in children with these symptoms. However, researchers have not been able to confirm a link between regular abdominal pain and H. pylori infection in children. Ulcer pain may be particularly confusing or disconcerting when it radiates to the back or to the chest behind the breastbone. In such cases it can be confused with other conditions, such as a heart attack. Peptic ulcers can also have a major effect on a person's finances. Research finds that the complications of peptic ulcer disease can cost from $1,800 to more than $25,000 per patient. Peptic ulcers caused by H. pylori or NSAIDs can be very serious if they cause hemorrhage or perforate the stomach or duodenum. Up to 15% of people with ulcers experience some degree of bleeding, which can be life-threatening. Ulcers that form where the small intestine joins the stomach can swell and scar, resulting in a narrowing or closing of the intestinal opening. In such cases, the patient will vomit the entire contents of the stomach, and emergency treatment is necessary. 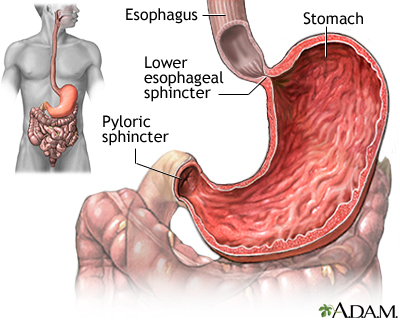 Complications of peptic ulcers cause an estimated 6,500 deaths each year. These figures, however, do not reflect the high number of deaths associated with NSAID use. Ulcers caused by NSAIDs are more likely to bleed than those caused by H. pylori . Because there are often no GI symptoms from NSAID ulcers until bleeding begins, doctors cannot predict which patients taking these drugs will develop bleeding. The risk for a poor outcome is highest in people who have had long-term bleeding from NSAIDs, blood clotting disorders, low systolic blood pressure, mental instability, or another serious and unstable medical condition. Populations at greatest risk are the elderly and those with other serious conditions, such as heart problems. H. pylori is strongly associated with certain cancers. Some studies have also linked it to a number of non-gastrointestinal illnesses, although the evidence is inconsistent. Stomach cancer, also called gastric cancer, is the third leading cause of cancer death worldwide. In developing countries, where the rate of H. pylori is very high, the risk of stomach cancer is six times higher than in the U.S. Evidence now suggests that H. pylori may be as carcinogenic (cancer producing) to the stomach as cigarette smoke is to the lungs. When H. pylori infection starts in adulthood it poses a lower risk for cancer, because it takes years for atrophic gastritis to develop, and an adult is likely to die of other causes first. Other factors, such as specific strains of H. pylori and diet, might also influence the risk for stomach cancer. For example, a diet high in salt and low in fresh fruits and vegetables has been associated with a greater risk. Some evidence suggests that the H. pylori strain that carries the cytotoxin-associated gene A (CagA) may be a particular risk factor for precancerous changes. Although the evidence is mixed, some research suggests that early elimination of H. pylori may reduce the risk of stomach cancer to that of the general population. It is important to follow patients after treatment for a long period of time. People with duodenal ulcers caused by H. pylori appear to have a lower risk of stomach cancer, although scientists do not know why. It may be that different H. pylori strains affect the duodenum and the stomach. Or, the high levels of acid found in the duodenum may help prevent the spread of the bacteria to critical areas of the stomach. H. pylori also is weakly associated with other non-intestinal disorders, including migraine headache, Raynaud disease (which causes cold hands and feet), and skin disorders such as chronic hives. About 10% of people in the U.S. are expected to develop peptic ulcers at some point in their lives. Peptic ulcer disease affects all age groups, but it is rare in children. Men have twice the risk of ulcers as women. 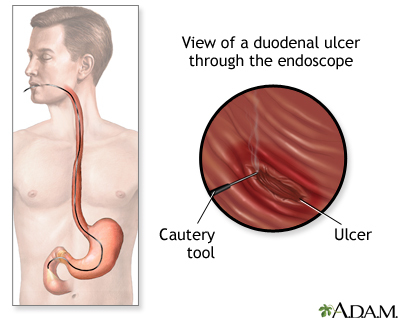 The risk of duodenal ulcers tends to rise starting at age 25, and continuing until age 75. The risk peaks between ages 55 and 65. Peptic ulcers are less common than they once were. Research suggests that ulcer rates have even declined in areas where there is widespread H. pylori infection. The increased use of proton pump inhibitor (PPI) drugs may be responsible for this trend. Treatments have also led to a reduction in the rate of H. pylori complications that require a hospital stay. H. pylori bacteria are most likely transmitted directly from person to person. Yet little is known about exactly how these bacteria are transmitted. About 50% of the world's population is infected with H. pylori . The bacteria are nearly always acquired during childhood and persist throughout life if not treated. The prevalence in children is around 0.5% in industrialized nations, where rates continue to decline. Even in industrialized countries, however, infection rates in regions with crowded, unsanitary conditions are equal to those in developing countries. Between 15 and 25% of patients who have taken NSAIDs regularly will have evidence of one or more ulcers, but in most cases these ulcers are very small. Given the widespread use of NSAIDs, however, the potential number of people who can develop serious problems may be very large. Long-term NSAID use can damage the stomach and, possibly, the small intestine. Anyone who uses NSAIDs regularly is at risk for gastrointestinal problems. Even low-dose aspirin (81 mg) may pose some risk, although the risk is lower than with higher doses. The highest risk is among people who use very high-dose NSAIDs over a long period of time (more than the typical 1-2 weeks), especially patients with rheumatoid arthritis. Other people who take high doses of NSAIDs include those with chronic low back pain, fibromyalgia, and chronic headaches. Peptic ulcers are always suspected in patients with persistent dyspepsia (bloating, belching, and abdominal pain). Symptoms of dyspepsia occur in 20 to 25% of people who live in industrialized nations, but only about 15 to 25% of those with dyspepsia actually have ulcers. It takes several steps to accurately diagnose ulcers. Heart Problems. Chest pain, such as from angina or a heart attack, is more likely to occur with exercise and may radiate to the neck, jaw, or arms. In addition, patients typically have distinct risk factors for heart disease, such as a family history, smoking, high blood pressure, obesity, or high cholesterol. Simple blood, breath, and stool tests can detect H. pylori with a fairly high degree of accuracy. Experts recommend testing for H. pylori in all patients with peptic ulcer disease, because it is such a common cause of this condition. Some doctors argue that testing for H. pylori may be beneficial for patients with dyspepsia who are regular NSAID users. Given the possible risk for stomach cancer in H. pylori- infected people with dyspepsia, some experts now recommend that any patient with dyspepsia lasting longer than 4 weeks should have a blood test for H. pylori . However, this is a subject of considerable debate. The following tests are used to diagnose H. pylori infection. Testing may also be done after treatment to ensure that the bacteria have been completely eliminated. Breath Test. A simple test called the carbon isotope-urea breath test (UBT) can identify up to 99% of people who have H. pylori. Up to 2 weeks before the test, the patient must stop taking any antibiotics, bismuth-containing medications such as Pepto-Bismol, and proton pump inhibitors (PPIs). As part of the test, the patient swallows a special substance containing urea (a waste product the body produces as it breaks down protein) that has been treated with carbon atoms. If H. pylori are present, the bacteria convert the urea into carbon dioxide, which is detected and recorded in the patient's exhaled breath after 10 minutes. This test can also be used to confirm that H. pylori have been fully treated. Blood Tests. Blood tests are used to measure antibodies to H. pylori, and the results are available in minutes. Diagnostic accuracy is reported to be 80 to 90%. One such important test is called enzyme-linked immunosorbent assay (ELISA). An ELISA test of the urine is also showing promise for diagnosing H. pylori in children. However, this test shows whether a patient has been exposed to H.pylori at some point in their lives. It does not necessarily confirm an active current infection. Stool Test. A test to detect the genetic traces of H. pylori in the feces appears to be as accurate as the breath test for initially detecting the bacteria, and for detecting recurrences after antibiotic therapy. This test can also be used to confirm that the H. pylori infection has been fully treated. The most accurate way to identify the presence of H. pylori is by taking a tissue biopsy from the lining of the stomach. The only way to do this is with endoscopy, which is an invasive procedure. However, many patients are treated for H. pylori based on the 3 noninvasive tests listed above. Endoscopy (also called esophagogastroduodenoscopy or EGD) is a procedure used to evaluate the esophagus, stomach, and duodenum using an endoscope -- a long, thin tube equipped with a tiny video camera. When combined with a biopsy, endoscopy is the most accurate procedure for detecting the presence of peptic ulcers, bleeding, and stomach cancer, or for confirming the presence of H. pylori . Because endoscopy is invasive and expensive, it is unsuitable for screening everyone with dyspepsia. Endoscopy is usually reserved for patients with dyspepsia who also have risk factors for ulcers, stomach cancer, or both. Patients under age 50 who do not have alarm symptoms may be tested non-invasively for H. pylori and treated for the infection if they test positive. The doctor will remove about 10 small tissue samples (biopsies), which will be tested for H. pylori. An endoscopy to identify any ulcers and test for H. pylori probably gives the best guidance for treatment. However, dyspepsia is such a common reason for a doctor's visit that many people are treated initially based on their symptoms and blood or breath H. pylori test results. This approach (called test and treat) is considered an appropriate option for most patients. Patients who have evidence of bleeding or other alarm symptoms, or who are over age 50 should have an endoscopy performed first. 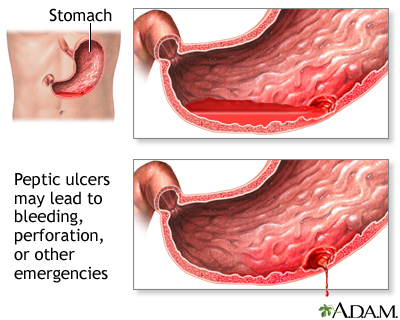 If an ulcer is seen and the patient is infected with H. pylori, treatment for the infection is started, followed by 4 to 8 weeks of treatment with a proton pump inhibitor (PPI). Most patients will improve with this treatment. If an ulcer is seen but H. pylori are not present, patients are usually treated with PPIs for 8 weeks. If no ulcer is seen and the patient is not infected with H. pylori, the first treatment attempt will usually be with PPIs. These patients do not need antibiotics to treat H. pylori. Other possible causes of their symptoms should also be considered. Most patients who do not have risk factors for complications are treated without first having an endoscopy. The type of treatment is decided based on a patient's symptoms, and on the results of H. pylori blood or breath tests. Patients who are not infected with H. pylori are given a diagnosis of functional (non-ulcer) dyspepsia. These patients are most commonly given 4 to 8 weeks of a PPI. If this dose is not effective, doubling the dose will occasionally relieve symptoms. If there is still no symptom relief, patients may have an endoscopy. However, it is unlikely that an ulcer is present. In this group of patients, symptoms may not fully improve. Patients who test positive for H. pylori infection will receive antibiotics to treat H. pylori. Those who have an ulcer are more likely to respond to antibiotic treatment. Because an endoscopy is not done before treatment in the test and treat strategy, patients who do not have an ulcer are also treated with antibiotics. Even if they test positive for H. pylori, patients who do not have an actual ulcer are less likely to have a full response to antibiotics. There is considerable debate about whether to test for H. pylori and treat infected patients who have dyspepsia but no clear evidence of ulcers, in part because H. pylori in the intestinal tract protects against GERD and possibly other conditions. There is also concern about the overuse of antibiotics, which can contribute to the emergence of antibiotic-resistant bacteria. The established treatment for H. pylori infection is a combination of antibiotics plus a PPI. Current standard therapy includes three medicines, two antibiotics plus a PPI, called triple therapy. Quadruple therapy refers to four medicines, in various combinations. For any of these regimens, the medicines may be taken in stages, one after another. This is called sequential therapy. Medicines may also be taken at the same time. This is called concomitant therapy. Due to the growing resistance to certain antibiotics and areas where standard therapy cure rates are somewhat low, various combinations and timing of medications are now under study. PPIs. These drugs include omeprazole (Prilosec), lansoprazole (Prevacid), esomeprazole (Nexium), pantoprazole (Protonix) and rabeprazole (AcipHex). PPIs are important for all types of peptic ulcers, and are a critical partner in antibiotic regimens. They reduce acidity in the intestinal tract, and increase the ability of antibiotics to destroy H. pylori. Patients typically take combination treatment for at least 14 days. A 7-day regimen is another option, but some research suggests that 14 days of therapy with antibiotics and PPIs is more effective at eradicating H. pylori . When quadruple therapy (without bismuth) is taken at the same time (concomitant therapy), cure rates appear similar to when the medicines are taken sequentially. Three drug regimens are complicated, expensive, and require many pills. Simpler regimens are being developed. Treatment may also fail if patients harbor strains of H. pylori that are resistant to antibiotics. When this happens, different drugs are tried. Studies in developed countries indicate that once the bacteria are eliminated, recurrence rates are below 1% per year. Re-infection with the bacteria is possible, however, in areas where the incidence of H. pylori is very high and sanitary conditions are poor. In such regions, re-infection rates are 6 to 15%. Get tested for H. pylori and, if they are infected, take antibiotics. Possibly use a PPI. Studies suggest that these medications lower the risk for NSAID-caused ulcers, although they do not completely prevent them. Acetaminophen. Acetaminophen (Tylenol, Anacin-3) is the most common alternative to NSAIDs. It is inexpensive and generally safe. Acetaminophen poses far less of a gastrointestinal risk than NSAIDs. However, patients who take high doses of acetaminophen for long periods of time are at risk for liver damage, particularly if they drink alcohol. Acetaminophen also may pose a small risk for serious kidney complications in people who already have kidney disease, although it remains the drug of choice for patients with impaired kidney function. The current recommended maximum daily dose of acetaminophen is 4 grams (4,000 mg). Patients should be aware that over 600 drug products contain acetaminophen. The FDA has called for manufacturers to limit the amount of acetaminophen to 325 mg per dose, tablet, or capsule in all combination products. The total maximum daily amount is 4,000 mg.
Tramadol. Tramadol (Ultram) is a pain reliever that has been used as an alternative to opioids. It has opioid-like properties, but is not as addictive. A combination of tramadol and acetaminophen (Ultracet) provides more rapid pain relief than tramadol alone, and more long-term relief than acetaminophen alone. Side effects of tramadol include dependence and abuse, nausea, and itching, but tramadol does not cause the same severe gastrointestinal problems as NSAIDs. Some patients take either a PPI or misoprostol along with their NSAID. Before starting a patient on long-term NSAID therapy, the physician should consider testing for H. pylori . The following drugs are sometimes used to treat peptic ulcers caused by either NSAIDs or H. pylori . Amoxicillin is a form of penicillin. It is very effective against H. pylori and is inexpensive, but some people are allergic to it. Clarithromycin (Biaxin) is part of the macrolide class of antibiotics. It is the most expensive antibiotic used against H. pylori. It is very effective, but there is growing bacterial resistance to this drug. Resistance rates tend to be higher in women and increase with age. Researchers fear that resistance will increase as more people use the drug. Ciprofloxacin (Cipro, generic) or levofloxacin (Levaquin), fluoroquinolone, is also sometimes used in H. pylori regimens. Metronidazole (Flagyl, generic) was the mainstay in initial combination regimens for H. pylori. As with clarithromycin, however, there continues to be growing bacterial resistance to the drug. Compounds that contain bismuth destroy the cell walls of H. pylori bacteria. The most common bismuth compound available in the U.S. has been bismuth subsalicylate (Pepto-Bismol). High doses of bismuth can cause vomiting and depression of the central nervous system, but the doses given for ulcer patients rarely cause side effects. PPIs are the drugs of choice for managing patients with peptic ulcers, regardless of the cause. They suppress the production of stomach acid by blocking the gastric acid pump -- the molecule in the stomach glands that is responsible for acid secretion. They are well tolerated during short term use. PPIs can be used either as part of a multidrug regimen for H. pylori , or alone for preventing and healing NSAID-caused ulcers. They are also useful for treating ulcers caused by Zollinger-Ellison syndrome. They are considered to be more effective than H2 blockers. Some people carry a gene that reduces the effectiveness of PPIs. This gene is present in 18 to 20% of people who are of Asian descent. If possible, patients should avoid long term use of PPIs. Long term use is may be associated with several adverse effects including Clostridium difficile intestinal infection, low magnesium levels, pneumonia, fractures, cardiac events, iron deficiency and rebound reflux symptoms. Older adults and those in long-term care facilities are at highest risk. In theory, long-term use of PPIs by people with H. pylori may reduce acid secretion enough to cause atrophic gastritis (chronic inflammation of the stomach), a risk factor for stomach cancer. Long-term use of PPIs may also mask the symptoms of stomach cancer and delay diagnosis. At this time, however, there have been no reports of an increase in the incidence of stomach cancer with long-term use of these drugs. H2 blockers interfere with acid production by blocking histamine, a substance produced by the body that encourages acid secretion in the stomach. H2 blockers were the standard treatment for peptic ulcers until PPIs and antibiotic regimens against H. pylori were developed. H2 blockers cannot cure ulcers, but they are useful in certain cases. They are effective only for duodenal ulcers, however. Ranitidine (Zantac) interacts with very few drugs. Ranitidine may provide more pain relief and heal ulcers more quickly than cimetidine in people younger than age 60, but there doesn't seem to be a difference in older patients. A common side effect of ranitidine is headache, which occurs in about 3% of people who take it. Nizatidine (Axid) has virtually no side effects and drug interactions. In most cases, H2 blockers have good safety profiles and few side effects. Because H2 blockers can interact with other drugs (such as theophylline, warfarin, phenytoin and lidocaine), be sure to tell your doctor about any other medications you are taking. There are also some concerns about possible long-term effects -- for example, that long-term acid suppression with these drugs may cause cancerous changes in the stomach in patients who also have untreated H. pylori infection. More research is needed to prove this risk. Liver damage . This is more likely with ranitidine than with the other H2 blockers, but it is rare with any of these drugs. Because misoprostol can induce miscarriage or cause birth defects, pregnant women should not take it. If pregnancy occurs during treatment, the drug should be stopped at once and the doctor contacted immediately. Diarrhea and other gastrointestinal problems are severe enough to cause 20% of patients to stop taking the drug. Taking misoprostol after meals should minimize these effects. One study indicated that taking the drug two to three times a day, instead of the standard regimen of four times, may prove to be just as effective and cause fewer side effects. Sucralfate (Carafate) seems to work by adhering to the ulcer and protecting it from further damage by stomach acid and pepsin. It also promotes the defensive processes of the stomach. Sucralfate has an ulcer-healing rate similar to that of H2 blockers. Other than constipation, which occurs in 2.2% of patients, the drug has few side effects. Sucralfate does interact with a wide variety of drugs, however, including warfarin, phenytoin, ketoconazole, fluoroquinolones, and tetracycline. Depending on the intensity of the bleeding, patients can be released from the hospital within a day or kept in the hospital for up to 3 days after endoscopy. Bleeding stops spontaneously in about 70 to 80% of patients, but about 30% of patients who come to the hospital for bleeding ulcers need surgery. Endoscopy is the surgical procedure most often used for treating bleeding ulcers and patients at high risk for rebleeding. It is usually combined with medications such as epinephrine and intravenous PPIs. Between 10 to 20% of patients require more invasive procedures for bleeding, such as major abdominal surgery. With endoscopy, doctors are able to detect the signs of bleeding, such as active spurting or oozing of blood from arteries. Endoscopy can also detect specific features in the ulcers, referred to as stigmata , which indicate a higher or lower risk of rebleeding. Endoscopy is effective at controlling bleeding in most people who are good candidates for the procedure. Rebleeding occurs in about 10 to 20% of patients. 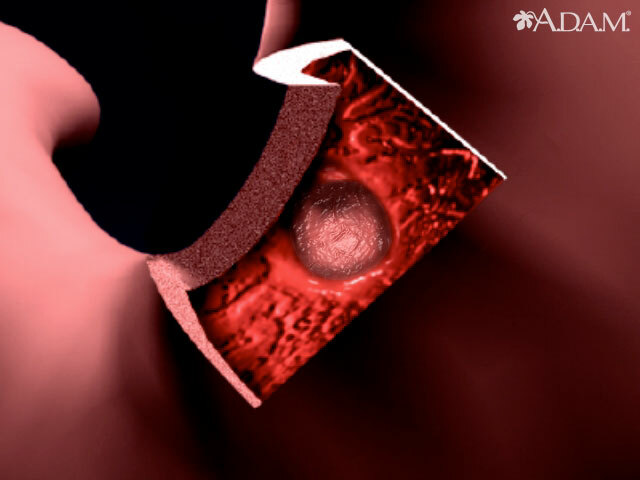 If rebleeding occurs, a repeat endoscopy is effective in about 75% of patients. Those who fail to respond will need to have an angiogram with embolization or major abdominal surgery. The most serious complication from endoscopy is perforation of the stomach or intestinal wall. Patients who harbor the H. pylori bacteria need triple or quadruple therapy, which includes two or three antibiotics and a PPI, to eliminate H. pylori immediately after endoscopy. Coffee and Carbonated Beverages. Coffee (both caffeinated and decaffeinated), soft drinks, and fruit juices with citric acid increase stomach acid production. Although no studies have proven that any of these drinks contribute to ulcers, consuming more than 3 cups of coffee per day may increase susceptibility to H. pylori infection. Garlic. Some studies suggest that large amounts of garlic may have some protective properties against stomach cancer, although one study concluded that garlic offered no benefits against H. pylori and, in large amounts, can cause considerable GI distress. Olive Oil. Studies from Spain have shown that phenolic compounds in virgin olive oil may be effective against eight strains of H. pylori, three of which are antibiotic-resistant. Vitamins. Although no vitamins have been shown to protect against ulcers, H. pylori appear to impair the absorption of vitamin C, which may play a role in the higher risk of stomach cancer. Ament PW, Dicola DB, James ME. Reducing adverse effects of proton pump inhibitors. Am Fam Physician . 2012;86(1):66-70. Barkun A, Leontiadis G. Systematic review of the symptom burden, quality of life impairment and costs associated with peptic ulcer disease. Am J Med . 2010;123(4):358-366.e2. Banerjee S, Cash BD, Dominitz JA, Baron TH, Anderson MA, Ben-Menachem T, et al. ASGE Standards of Practice Committee. The role of endoscopy in the management of patients with peptic ulcer disease. Gastrointest Endosc . 2010;71(4):663-668. Beaulieu RJ, Eckhauser FE. The management of duodenal ulcers. IN: Cameron JL, Cameron AM, eds. Current Surgical Therapy . 11th ed. Philadelphia, PA: Elsevier Saunders; 2014:76-80. Chan FK. Celecoxib versus omeprazle and diclofenac in patients with osteoarthritis and rheumatoid arthritis (CONDOR): a randomized trial. Lancet . 2010;376(9736):173-179. Chan FKL, Lau JYW. Peptic ulcer disease. In: Feldman M, ed. Sleisenger and Fordtran's Gastrointestinal and Liver Disease . 10th ed. Phialdelphia, PA: Elsevier Saunders; 2016:884-900. Drugs for peptic ulcer disease and GERD. Treat Guidel Med Lett . 2011;9(109):55-60. Feinstein LB, Holman RC, Christensen KLY, Steiner CA, Swerdlow DL. Trends in hospitalizations for peptic ulcer disease, United States, 1998-2005. Emerg Infect Dis . 2010;16(9):1410-1418. Lanza FL, Chan FK, Quigley EM. Practice Parameters Committee of the American College of Gastroenterology. Guidelines for prevention of NSAID-related ulcer complications. Am J Gastroenterol . 2009;104(3):728-738. Malfertheiner P, Selgrad M, Bornschein J. Helicobacter pylori: clinical management. Curr Opin Gastroenterol . 2012;28(6):608-614. McNicholl AG, Marin AC, Molina-Infante J, Castro M, Barrio J, Ducons J, et al; Participant Centres. Randomised clinical trial comparing sequential and concomitant therapies for Helicobacter pylori eradication in routine clinical practice. Gut . 2014;63(2):244-249. Morgan DR, Crowe SE. Helicobacter pylori infection. In: Sleisenger and Fordtran's Gastrointestinal and Liver Disease . 10th ed. Phialdelphia, PA: Elsevier Saunders; 2016:ch 51, 856-867. Spee LA. Association between Helicobacter pylori and gastrointestinal symptoms in children. Pediatrics . 2010;125(3):e651-e669. Sung JJ, Kuipers EJ, El-Serag HB. Systematic review: the global incidence and prevalence of peptic ulcer disease. Aliment Pharmacol Ther . 2009;29(9):938. PMID: 19220208 www.ncbi.nlm.nih.gov/pubmed/19220208 . US Food and Drug Administration. FDA Drug Safety Communication: Prescription acetaminophen products to be limited to 325 mg per dosage unit; boxed warning will highlight potential for severe liver failure. 1/13/2011. Available online. Wilkins T, Khan N, Nabh A, Schade RR. Diagnosis and management of upper gastrointestinal bleeding. Am Fam Physician . 2012;85(5):469-476. Wu CY, Kuo KN, Wu MS, Chen YJ, Wang CB, Lin JT. Early Helicobacter pylori eradication decreases risk of gastric cancer in patients with peptic ulcer disease. Gastroenterology . 2009;137(5):1641-1648.